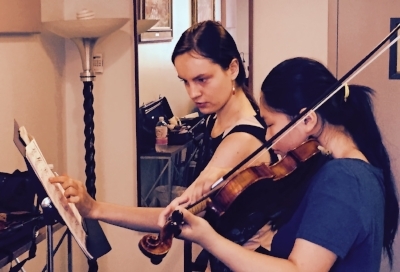 New York Violin Lessons is operated by Dr. Kinga Augustyn, an award-winning concert violinist with in-depth experience in training students at beginning, intermediate and advanced levels. She utilizes different methods that are tailored to the needs and abilities of her students. Dr. Augustyn received her bachelors and masters degrees from The Juilliard School, and her doctorate in music from SUNY at Stony Brook. Having studied with world famous teachers and musicians such as Ms. Dorothy DeLay, Ms. Naoko Tanaka, Cho-Liang Lin, and Kurt Sassmannshaus, among others, she enjoys passing on the body of knowledge she has gained herself. In addition to lessons in NYC, she also teaches through Skype. Dr. Augustyn has served on the Violin Faculty for The Alexander & Buono Festival of Music. She has also conducted various violin, piano and chamber music masterclasses and workshops in the United States and Poland. Most recently they have taken place at Queens College, Florida Gulf Coast University, Millikin University and Wroclaw Music University. Kinga Augustyn also teaches piano to students at beginner level. “Three years ago, I was a violinist that was lost in development. I was a freshman in high school and I had been studying violin for about nine years. However, I faced a plateau in my growth and technical skills. Prior to meeting Dr. Augustyn, I was told that she was very mindful of posture and a stickler for hand positions when playing the violin. Not only was this a perfect solution to my tendonitis issue, it brought hope to my technical development. During my first lesson with Dr. Augustyn, we mainly focused on the basics of violin technique in order to address my major setbacks. After correcting posture, removing the shoulder rest, and working on basic scales, I felt as if playing was much easier than it was before.